Dill is a leafing herb with a strong personality – though delicate and fragile looking, it’s a force to reckon with as it can aggressively compete for resources with bigger fruiting veggies, and once established in your urban farm, will stay put for life. 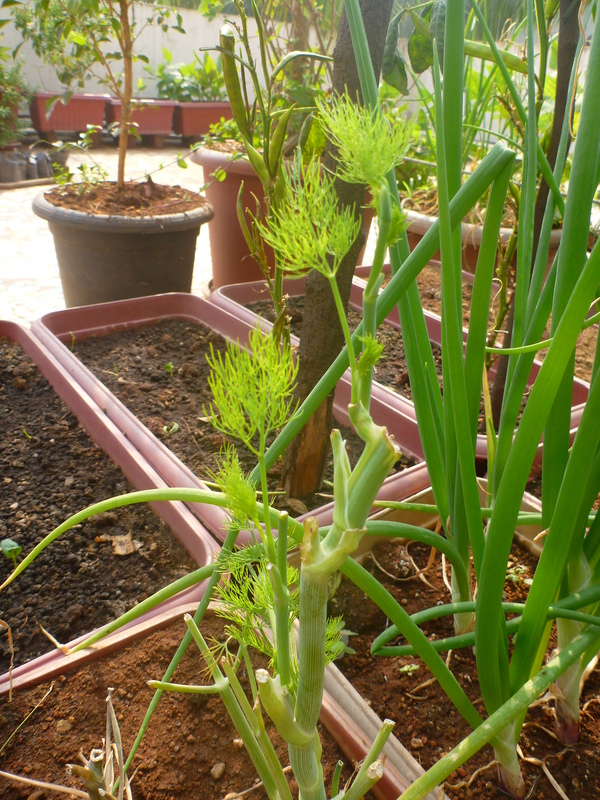 SEASONS: Dill is an annual plant and can be sown and grown quite successfully in Mumbai’s tropical climate. PROPAGATING: This herb is relatively easy to propagate from seed. It also self-seeds once mature, scattering its mature seed heads into neighboring soil. GERMINATING: Sow dill seeds through the year, though the humidity of the monsoons makes it the optimal time for germination. It can be germinated in germination dishes/seeding baskets prepared with a mixture of compost and peat moss, but is preferably sown directly in the ground as it does not like being transplanted. Seeds can be shown in shallow, 1/2 inch deep holes and at least 8 inches apart to allow room for growth. Place in semi-shade and spray water evenly. Spray your sown seeds daily until seedlings emerge in 7-15 days. PLANTING OUT: Transplanting the delicate and fragile looking dill sapling, even after 2 weeks of sturdy growth, can be tricky. So be careful to scoop up attached soil and not destabilize the sapling too much. The dill plant is not particular about soil and will grow in acidic, neutral and alkaline soils, as long as they are well-drained and well-composted to allow its big tap roots to reach deep downwards and absorb vital nutrients. Avoid planting dill near fruiting veggies as they may either cross-pollinate with them, or compete with them ferociously for resources. The plants that dill with be companionable with are few, and these are beans, onion and fennel. It will grow well on open plots or in deep containers (shallow ones will stunt growth). NURTURING: Your dill seedlings will grow fragrant, wispy leaves that will make your urban farm look mystical and inviting! Well-rooted dill plants grow to several feet in height. They need little nurturing as they repel most harmful insects and tend to attract the beneficial ones. Water regularly. HARVESTING: Dill is harvested for its leaves and its seeds. Keep harvesting leaves as they grow out. If you are growing dill mainly for leaf harvesting/consumption, you may need to keep trimming your plant down to delay the formation of seed heads. If you plan to harvest seed heads, then allow your plant to grow unfettered till maturity, so seed heads develop. Once ripe, harvest and thresh the seeds, and dry thoroughly before use. After a year’s harvest, or when stems turn yellowed and old, uproot, compost, replenish the soil and use that space for growing fruiting or rooting veggies.